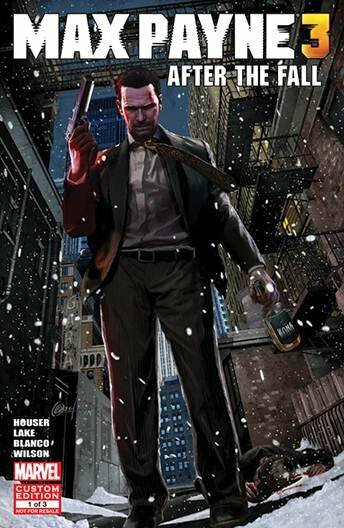 Rockstar announced that they've released the first issue of their Max Payne 3 digital comic. "After the Fall" can be read in its entirety on Rockstar's website or downloaded as a PDF. "After the Fall" kicks off with former NYPD detective Max Payne getting in a bar scuffle in Hoboken - a scene from Max Payne 3. It then jumps back in time to reveal more of Max Payne's past. It even provides new insights into events from Max Payne and Max Payne 2. The cover art for "Fall" (below) was provided by Greg Horn, while Fernando Blanco handled pencils and inks. The story is co-written by Max Payne 3 scribe Dan House and Remedy Entertainment's Sam Lake. Lake was the writer of the first two Max Payne games, so his involvement should guarantee everything stays canon. Rockstar plans to give out printed editions of the comic to select Rockstar Social Club members. They'll give a copy a week from now until the end of June. You can sign up for this giveaway here. Max Payne 3, meanwhile, will debut in North America on May 15th on consoles. The PC release will follow on May 29th. Rockstar opened up pre-orders for a "DLC pass" for the game earlier this week.